THE BLOB Has Dissipated | Watts Up With That? As shown, The Blob began to decay noticeably in early-to-mid October and has, now, basically disappeared from its normal location, though there are still elevated sea surface temperature anomalies in the eastern and central extratropical North Pacific. We should expect a noticeable decline in the sea surface temperature anomalies this month in The Blob region, and in the North Pacific as a whole, when the monthly sea surface temperature data for October are published early next month. Will The Blob disappear for good in the future or will it reappear annually during the boreal summer months as part of a new seasonal cycle? Only time will tell. 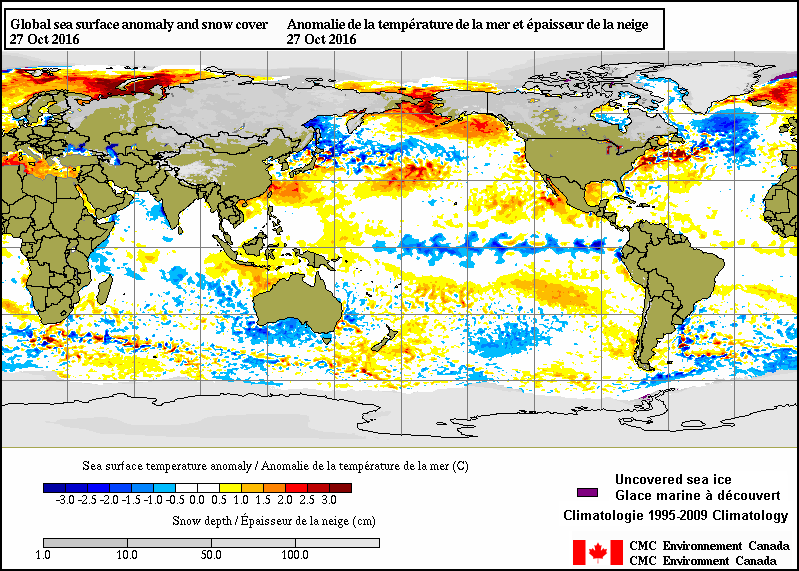 October 27, 2016 in Sea Surface Temperature. As someone who used to live in California, the offshore oceanic conditions do greatly influence weather in California. Whether the fronts go into Washington and BC, or dip down enough to hit California, seem determined by standing highs offshore. Strikes me as upwelling yet isn’t the nail salinity entering the Arctic? Salinity was and is the cause of ice conditions Arctic past to present? Actually it was a GODZILLA FART from bad whale blubber. Stopped that Governor Moonbeam. Living in California I can note that the “Blob” did cause a bit of consternation that the spring rains did not materialize as strongly as “El Nino” usually delivers. Now that the “Blob” has moved on we have received some welcome showers recently. Enough so it seems that the news was reporting “unprecedented” (“they keep using that word. I don’t think it means what they think it means”) rain. Well at least unprecedented since the last time it happened. “Well at least unprecedented since the last time it happened.” – LMAO. Thanks, you made my day. I heard that the precipitation for our area (S.E. Washington State) thus far into the month of October places it among the top 10 wettest Octobers since 1885. Wow, all of us have become accustomed to the The Blob. I’m really going to miss it. It’s become part of my family and now … My son was going to dress up as it for Halloween and now it would seem it would be a cruel gesture. Maybe they can reduce the “normal” by 3 deg C and have it come back to life. RIP “The Blob” we hardly knew ye. I’m missing it already. iSad. It looks like the path that hurricane Matthew took is also colder after the event. So it would seem that a followup hurricane in that region is less likely. Yeah,the rains have suddenly come in the last 10 days, in my city of Kennewick,Wa. After being so darned dry for the last two years. That was in West side of the Cascade Mountains. Actually, most of Eastern Washington was very wet last winter, one of the wettest ever recorded. Kennewick in 2015 was only about an inc below normal in precip, after being about 2 inches below normal in 2014 and 2015. 2016 should end up with an above average rainfall for Kennewick. No it was not unusually wet in the Tri-City area where I live,the 2016 Summer was very DRY. This October is the first time in THREE years that a month of above average precipitation shows up. In Kennewick,where I reside,the yearly rainfall average is around 7.25 inches in a year. It is NORMALLY a dry place. Lovely patterns along the equator west of S America. Those blue equatorial patterns look remarkably like la Niña. I hadn’t checked SST anomalies for a while. Apparently the SOI hasn’t met the criteria for a La Niña. In fact, Weather Bell was saying Saturday that the SOI hasn’t reached the threshold and that changes going on around Australia and the Indian Ocean may cause the La Niña to dissipate. Joe Bastardi said, also, that we could possibly have another El Niño next year. For a change, try believing anything from the entire US government. Was it six impossible things before breakfast that the Red Queen expected Alice to accept? Wonderland or Looking Glass . . . .
Auto – not as familiar with English Literature as I thought I was . . . It was great for alarmism while it lasted. The same can be said with the North Atlantic and a number of other opportunistic distortions for fun and win-the-day politics. Depending on how the elections go on 8 NOV, environmental measurements such as SST may not really matter anymore as far as US of A policy go. One way, CO2 caused environmental Armageddon is a foregone conclusion, carbon dioxide emission taxation will be imposed across the nation, among other not-so-nice outcomes. Measurements (adjusted or otherwise) become less science and more of a hammer to pound home the ideological advance toward a More Perfect Global Union. The other way, while science should (one hopes) become more realistic/based upon empirical measurement and scientific methodology, utilized to assist in more realistic policy choices for daily use of our surroundings/resources (air, soil, water use) – and the CO2 scare becomes the shrill scream of the losing side (to be ignored, completely at least for four years) – an all-of-the-above approach to energy production would be a ‘breath of fresh air’. Your sayin is politically simplistic. Hillary, if elected, will almost certainly face a Republican congress and will have no more success advancing an agw agenda than her predecessor. Trump, in the extremely unlikely event of his election, does not have the political smarts or mandate to dismantle existing climate change policy. Climate change is a fringe election issue at best. Neither candidate will risk political capital to attempt more than minor changes to policy. The arctic waters are dumping a lot of heat now. Is that what has caused the record low in Arctic ice, for the end of October? The scale of the blob, watching it move easterly, and the speed with which it dissipated, about two weeks, suggests it is of very shallow depth, perhaps just a few MM of water depth involved in that SST. If it were deeper, it would take longer to dissipate, because water cools far more slowly than air. 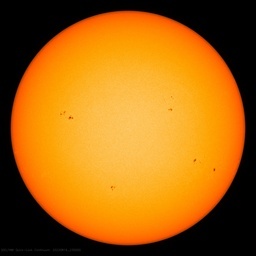 It also suggests that it might be related to sea surface roughness and incoming solar, i.e. wind and clouds. It all says “weather pattern” to me. Just look at the waves of the La Niña on the Equator, moving west, wind driven. They arrive and dissipate with similar speed. Too bad we can’t get a retroactive view of winds there from the earth.nullschool.net web page. Might be interesting to see what was going on. To go backward in time you can also use the letter j for going backward 1 day. With Shift + j you will make 5 day steps backward. Forward: the same but than with the letter k. In the adress bar the exact date is shown. I followed the blob a bit at Nullschool. It dissipated when there was a strong low pressure area over there. Strong winds and mixing of the upper layers, evaporation, clouds and no incoming solar seemed to make the blob disappear. Unfortunately it was not visible what was happening below the surface: which subsurface water with what temperature was coming in? I suppose high pressure area’s (a few wind, incoming solar) help to sustain blobs. It would be interesting to know how deep the warm water layer was. I myself think it will at least have been a 5-10 meter, perhaps a 25 meter. Otherwise it would have disappeared after the first strong mixing winds. And it couldn’t have had such a high influence on the air temperatures last year as well. And it couldn’t have had such a high influence on the air temperatures last year as well. Well……, but it moved the jet streams path over the continent, and that changed the weather. My guess would be the high pressure system is the main cause of the Blob. Things get hot underneath high pressure systems. The longer they sit in one position, the hotter it gets underneath them. The Blob is gone? Is it hiding in the ocean? In the Deep Ocean. With Godzilla. Indeed – we’re all doomed! Mods – sarc. Utterly sarc. The only thing we have to fear is cooling. And a tribute to ‘Dad’s Army’, the creator of which, Jimmy Perry, has just died. Just a simple farmer here. so could someone please tell me exactly where the ridiculously resilient ridge was/is that contributed to this thing? Is it an upper level ridge or what? I can’t seem to find much info but then I’m not to internet savvy either. A neighbor asked me why the harvest weather up here in Saskatchewan has been so terrible (one system right after another, cold with 8 inches of snow on Oct. 5th we never recovered from). I’ll be the first to say it’s weather not climate, but beyond blaming the “blob”, what is the weather phenomenon that seems to be persistently driving the jet stream and storm tracks right across us in Sask? It’s looking like this will be the first time we will have ever had crop out over winter. Any more of this “warming” and we might have to seed it all back to grass and raise livestock. The cooler-than-average waters will still influence the late fall and winter season. Even if the waters miss the needed criteria, borderline conditions can still affect weather patterns and resemble a weak La Niña. 3. Note the “blue blob” in Bob Tisdale’s (boy, was I afraid I would type “Blob Tisdale”!!) animation of SST data above. At the “Start” of the animation, it appears to zoom east, into the warmer (thus, lower pressure) warm “blob” area and you can see the warm blob shoved down and over toward the southwest. Then, around July, 2016, the blue blob looks like a big ocean liner docking at Long Beach, California. That cooler air, given the prevailing winds, may have had an impact on your late summer/early autumn in Canada (sure hope someone confirms or denies this guess!). Note: I mis-typed above — the Weather Bell info. is only the #1 item (in a wattsupwiththat article quoting Joe Bastardi). See that orange blob of warmth hovering over Oklahoma; I’ll take the 10-20 degrees above average anytime over the blizzards a few years ago when heavy horizontal snow blocked out house visibility 300 feet away. Of course, this winter has yet to arrive, so who knows? Janice mentioned weatherbell and Joe Bastardi. You can learn a lot from watching his short videos he puts out daily and his longer Saturday summary video. I visit the site daily Monday through Saturday. Below is a link to the site. Once there go up to the top and click the “Premium” tab and the video for that day and the last Saturday summary will pop up. Don’t worry, it’s free content. Won’t cost you a dime but I have found in an invaluable source for learning about weather. Good to know how to look ahead, too. Take care out there on the road — no WONDER a road warrior like you is a weather expert! However, those summaries are not on the premium side. To find them, just scroll the new page down until they show up. Thanks to everybody for the info. I’ve got some study’in to do. Looks like Janice is pretty astute and has me figured out. Granddad was born and raised in southern Minnesota, homesteaded up here. Yup, his name was Ole. Judging by the animation it looks like it’s been moved into the Bering St. This perfectly shows the source of the Blob, it’s a void between wind currents, so the airflow stalls, and the ocean water warms in the Sun. Which becomes a high pressure zone and the air goes around it. Think of it as a thumbprint that sticks around for a while. yeah I noticed the same, looking to create an animation of it for comparison, but the nullschool SST doesn’t seem to pick up the blog very well. I think the 97 step in temp is the same sort of thumb print, the temperature changed in the 20 to 30 North Latitude band, the other non-tropical zones continued to do the same thing after as they did before. The response is in degrees F for 1 W/m^2, the Whr (/m^2) listed is the same value, just expressed differently, to a watt of Sun light. Since I don’t adjust for clouds or anything else, this is the effective sensitivity. I love the way the spell checker picks up most of the typed “blobs” and changes them to “blogs. The new IOS operating system is even worse at second guessing. Greenland ice sheet surface mass balance record growth. Any thoughts? 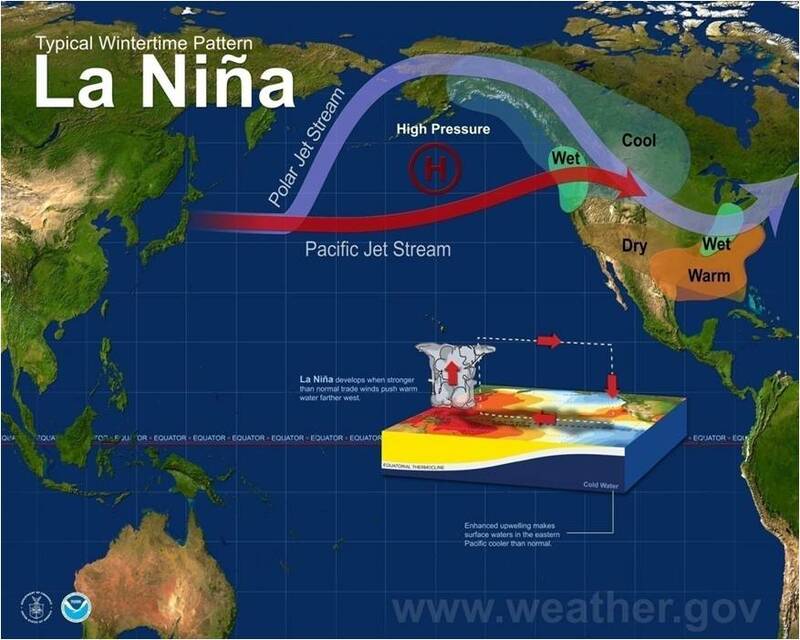 Interesting ramifications for this winter if The Blob is gone and the LaNina weakens. These were the two major factors that In the past gave us higher pressures over Greenland and lower pressures under Alaska. Those pressure patterns gave us a negative arctic oscillication index that made the polar vortex visit US east of Mississippi River that resulted in cold winters. Will the AO index still go negitive under LaNada condition? Early winter? Late Spring? More snow? So I guess I was a bit premature in welcoming our new blob-overlord? Blast, no blob means we are in for some colder temps out here on the left-most fringes of the civilized world. All we had going for us was the blob, now it’s gone… Bummer. Nope, sorry but that blob changed to an icky green colour, and unfortunately it is here to stay. ! Currently rapidly growing ice in the Bering Sea. Yes, there seem to be a few ‘fixed’ hot spots like the chain of hot spots running east from South Africa, can we guess they are caused by volcanism? Also, I see a general global cooling, look closely as south west Australia and the Indian Ocean. What’s going on? Here in Godzone we are just days from Beltane, and the soil and plants could use some serious heat. Ah well , that’s renewable energy for you . . . it’s all over the shop. This is an update to the California Drought Report #47. The reported blog and it’s consequences are no longer present. Perhaps we can coordinate something like https://www.youtube.com/watch?v=CFrP6QfbC2g&feature=youtu.be . It is the Epic missions year long video of the sunny side of earth. They have daily info also. If there is an atmospheric cause behind this “blob” shouldn’t it show up somehow? I remember that movie. It was rerun in the 60s. I also remember a made-for-TV version of The Andromeda Strain, in the 60s. I might be misremembering that, but the book was much better than the movie I recall. I got a paperback reprint a few years ago. Michael Crichton was >>>>>>>>> better at novels than Stephen King. Dissipate? It look like it’s being pushed through the straight. What happens when it meet fall and inter arctic winds? Great Animation. It really gives one a feel for the situation. Time will tell but the third option is that it will be reinstated by models.